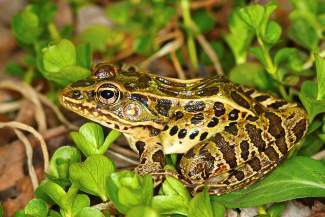 Amphibians like this Leopard Frog are increasingly endangered of exctinction. We humans are good at many things — walking on hind legs, using tools, deploying our advanced language skills to talk about the weather — but sharing the planet with our fellow animals ain’t one of them. A massive new study from the World Wildlife Fund has the gory details: Population sizes of birds, mammals, reptiles, amphibians and fish have declined by 52 percent over the last 40 years. In other words: the Earth has just half as many animals as it did in 1970. I’ll give you a minute to let that sink in. WWF scientists arrived at that tragic conclusion by examining trends in more than 10,000 wildlife populations — including 2,028 populations that live at least partly in the United States, from Acanthogobius flavimanus to Zosterops japonicus. What does the WWF report, called the “Living Planet Index,” say about wildlife out here in the American West? We combed through the LPI data portal to see how our region’s animals are faring. If there’s one thing conservation is good at, it’s throwing money at the big-eyed furry critters. And as WWF data (and numerous other studies) reveal, those efforts are largely working: Wolves are flourishing, Yellowstone’s grizzlies have recovered enough that they may soon be delisted and mountain lions have recolonized Hollywood Hills. Those findings shouldn’t surprise followers of Western wildlife news, but they’re still striking — especially compared with the tigers, rhinos and elephants that are being poached out of existence in Asia and Africa. Turns out it’s easier to keep wildlife alive when you can pay rangers and enforce protected areas. Anybody seen any lowland leopard frogs lately? Little brownish-green guys, dark markings on their backs, used to be abundant throughout the Southwest? If you haven’t spotted any, you’re not alone: According to studies cited in the data portal, two distinct populations have plummeted. The decline of lowland leopards mirrors the national die-off of amphibians: scarcely mourned victims of habitat loss, invasive species and the spread of the fungal disease Chytrid. It’s great that we’re devoted to conserving mammals — but we need to invest in amphibian solutions, too. Consider that iconic Western beast, the American bison. On the precipice of extinction just a century ago, bison are now secure within Yellowstone National Park, and their protected status is reflected in their numbers: According to one study in the LPI database, the population of a single herd leapt from just 482 animals in 1984 to 1,460 in 2004. But incremental improvement doesn’t equal recovery — not when you consider that 19th century trains often idled for hours to allow “living streams” of shaggy beasts to pass. Zoom out to 1970 and you see progress; but zoom out to, say, 1770 and you see disaster. Scientists call these sliding standards “shifting baseline syndrome,” the process of ecological forgetting that causes each generation, ignorant of past abundance, to embrace as natural its degraded present. The trick is to celebrate conservation’s accomplishments without settling for a new, diminished status quo. When it comes to managing its animals, the U.S. has a lot going for it: Our tough (albeit still imperfect) Endangered Species Act, our scientific resources, our robust civil society. Overall, biodiversity in high-income nations like ours has actually increased by 10 percent. Yet in taking our conservation strides, we’ve walked all over the planet. Consider, by way of example, fisheries. According to the WWF report, 37 percent of surveyed wildlife populations are threatened primarily by exploitation — for the most part, that’s hunting and fishing. What’s America’s role? Well, while we’ve rebuilt fisheries here at home, we also import 91 percent of our seafood — meaning that international fisheries are overexploited to put food in our bellies. “In effect, wealthy nations are outsourcing resource depletion,” said Keya Chatterjee, WWF’s senior director of footprint, in a news release. In sum: We may be doing a half-decent job conserving our wildlife domestically, but we’re as culpable for global loss as anyone. Ben Goldfarb is a correspondent at High Country News. Follow @ben_a_goldfarb. Originally published on Oct. 7, 2014, at High Country News (hcn.org).